... and this is just from the first 4 pages! Page 31 reveals one health problem WORSE THAN SMOKING! ... this has an even bigger impact on causing diabetes than fat. Flip to this page immediately upon receiving the book, so you can become aware of the specific ways that toxins may be entering your body, right now! In The Toxin Solution, Dr. Pizzorno provides proven detox methods developed to heal toxic overload and restore health in JUST EIGHT WEEKS! YES! I Want To Order The Toxin Solution! Dr. Joe Pizzorno founded Bastyr University, the country’s first and largest fully accredited university of natural medicine, and served as its president for twenty-two years. He is the author of The Encyclopedia of Natural Medicine and The Textbook of Natural Medicine, a founder and board member of the Institute for Functional Medicine and founder and editor-in-chief of Integrative Medicine: A Clinician's Journal, the leading peer-reviewed journal in integrative medicine. He has been honored by the American Association of Naturopathic Physicians, the National Foundation for Alternative Medicine, and Natural Health Magazine, and has served on presidential committees under Presidents Bill Clinton and George W. Bush. He lives in Seattle, Washington. In The Toxin Solution, Dr. Pizzorno provides proven detox methods developed to heal toxic overload and restore health in just eight weeks. "This book should be a mandatory part of all medical school curriculums. And for any human living in the 21st centruy seeking to improve their health this book is the essential reading." ...The Toxin Solution shows us where toxins are, how they affect our health and how to follow a very simple plan for getting rid of many toxins to help us on the road to wellbeing." "Surprising and disturbing, and also illuminating, and hopeful. Dr. Pizzorno, a world-renowned authority on natural medicine, presents cutting edge research that shows how the toxins in our environment and our food make us ill. He gives us clear, easy to follow guidelines for reversing the process and restoring and enhancing our health." Dr. Joseph Pizzorno has crafted a welcome examination of the man-made world and its effects on our health and longevity. Clearly and engagingly written, this book does not shy away from data and scientific evidence, which is presented in a balanced and straightforward manner. Of particular value is a gift that only a seasoned clinician can provide: An abundance of helpful and effective prescriptive advice. A much-needed and timely addition to your self-help library. "We have been waiting for this ground breaking book, "The Toxin Solution", from natural medicine leader Dr. Joseph Pizzorno. There has been the need for a person of his stature and understanding of the field to separate the fact from the fiction as it relates to toxicity and detoxification. This important book provides information that only an expert in the field could compile and describe in a such an understandable way that it takes the discussion of toxicity from theoretical to actionable. 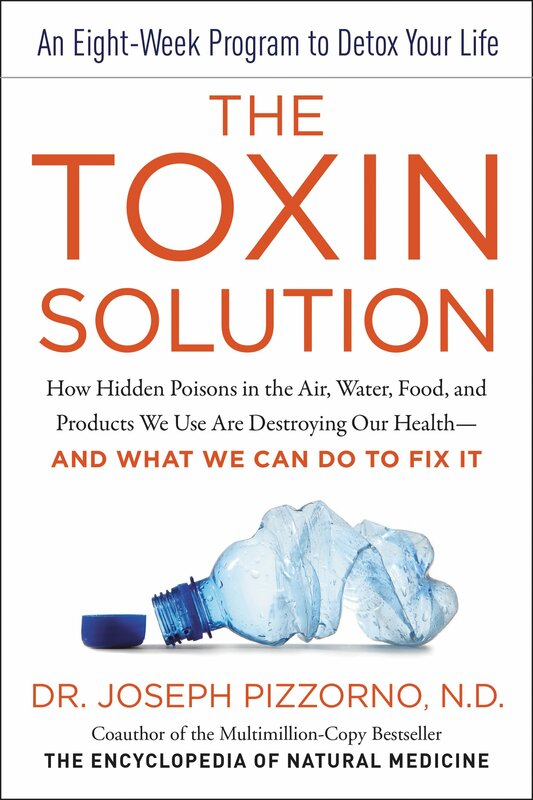 This is a must read for anyone seriously interested in how environmental toxins influence human health and what a person can do to reduce their body burden of these disease producing chemicals". .....The Toxin Solution shows us where toxins are, how they affect our health and how to follow a very simple plan for getting rid of many toxins to help us on the road to wellbeing."